In recent days the Mental Health Institute of Legal Professions (ISMA, by its abbreviation in Spanish) has been immersed in a vortex of frenetic activity that, from the Council of Government, is very positively assessed. As it had been announced for some time, the ISMA held last Friday its official presentation at the facilities of our official partner, the Instituto Superior de Derecho y Economía (ISDE). The breakfast, which was entitled “Concern about legal professionals generates added value,” counted with the interventions of several personalities from the legal and health world and was moderated by the Executive Director of ISDE, Montse Pintó. The first presentation, which was made by Dr. Maria Cruz Martín Delgado, Head of the Intensive Medicine Service of the University Hospital of Torrejón and President of the Spanish Society of Critical Intensive Medicine and Coronary Units (SEMICyUC, by its abbreviation in Spanish). Besides, she is the promoter of the HU-CI project (the acronym for “Humanizing Intensive Care“). In his fascinating presentation, the essential pillars of the HU-CI project were addressed, among which the following stand out: (i) open doors in the ICU, making the visiting hours more flexible and adapting it to the individual needs of each patient; (ii) improve the communication of the medical team and patients and family members; (iii) improve the comfort of patients, both physically, as well as in the psychological, spiritual and environmental aspects; (iv) encourage family participation in intensive care, (v) worry about the professional (professional burnout, work on providing professional teamwork skills, resilience, coaching, compassion, among others); etc. Then, it was the turn of Carlos Bel, Head of Human Capital (RRHH) in Catalonia of PwC. In his speech, Mr. Bel explained the way in which, from his Law Firm, steps are being done to improve the working conditions of its professionals. Among the proposed measures, despite not finding the right to disconnect, there are others that discourage the presence in large offices: as the hotelling. This measure was complemented by an incentive to telework. In fact, the most exciting thing is that he said that the ultimate goal of PwC was for employees to only come to the office to collect documentation or meet with clients. Also, employees can select from a wide range of measures of physical and mental well-being. Finally, the President and the First Vice President of the ISMA made their presentation. As a prelude, the First Vice President presented the project and took the opportunity to thank the ISDE, the attendees and, in particular, the ISMA members who attended the presentation. Once the well-deserved acknowledgments were made, Manel Atserias explained the Institute’s guidelines, its social character, the national and international alliances and the ongoing projects, such as the search for funding for the constitution of ISMA as a charity. In addition, they faced the problem that the ISMA intends to fight because, as the First Vice President of the ISMA said, the best thing would not be that the ISMA would grow and the day would come when it could offer help to all professionals, but that the ISMA would not exist at all. If the ISMA had never been created it would mean that there are no problems and that the profession is exercised in a healthy way. Among the most well-known faces is that of a member of our Advisory Board, Brian Cuban, who is an example to follow because he managed to recover from his addictions (alcohol and cocaine) and various disorders (such as Bulimia and Body Dysmorphic Disorder). He is currently a professional who gives lectures in professional colleges and law schools throughout the American territory, as well as publishes and intervenes in newspapers and television programs with the most significant impact in the United States. The conference was followed by a question and a networking session in which members of the Governing Council were able to speak with professionals from different fields, learn and weave future alliances. At the end of the ceremony, a photograph was taken of the members of ISMA and ISDE who attended the event, as well as some of the interested parties. In the following picture you can see, from left to right, and from top to bottom: Andrés Cervantes, Montse Pintó, Manel Atserias (President of ISMA), Nuria Moreno (Lawyer and First Lieutenant of the Mayor of Mataró City Council), Dolors Lliria (Deputy Secretary of the Governing Board of the Official College of Psychology of Catalonia), Marisa Méndez (member of the Wellbeing Committee of ISMA), Tomás Gabriel García (First Vice President and Secretary of ISMA), Francesc Domínguez (Brand Director of ISMA), Ferran Garcia de Palau (member of the Wellbeing Committee of ISMA), Dr. Maria Cruz Martín Delgado, Javier López and Marta Lopera (Second Vice President and Communications Director of ISMA). Along with the above, the ISMA has another fact to be proud of it: its appearance in various media at the regional and national level. 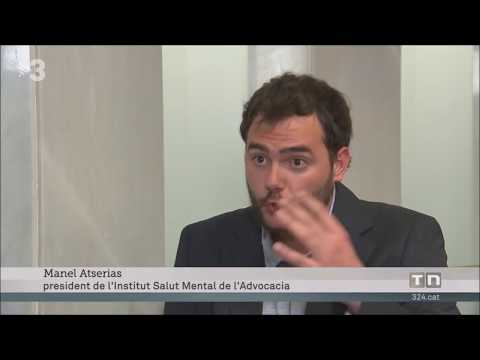 Last Sunday, May 20, 2018, in the End of the Week Report (broadcast on the Telenotícies Vespre of TV3) the interviews of Ferran Garcia de Palau and Tomás Gabriel Garcia were shown, exposing their experiences in the world of the legal profession; and the purpose for which the ISMA was born was explained. We strongly recommend that you click here to watch the masterly report that the TV3 team, led by Víctor Prats, has made. The recordings were made between May 11 and 18, 2018 in the studios of TV3 located in Sant Joan Despí and they intervened, in addition to the TV3 teams, Manel Atserias Luque, Marta Lopera, Tomás Gabriel García and Ferran Garcia de Palau. In addition, on May 22, the President of the ISMA, Mr. Manel Atserias Luque was interviewed by the radio station COPE to talk about the Mental Health Institute of the Lawyers. If you want to hear his speech, click here (from minute 56:11).